When I was a kid growing up on the farm in the ‘60’s, my family always had a big vegetable garden. We would grow beans, tomatoes, carrots, sweet corn, squash, and odds and ends of other vegetables too. We didn’t grow peas because my dad grew acres of them for the local pea canning factory. It was our job as kids to help to plant, weed and harvest our garden. Growing a garden was a family tradition as I also remember my grandfather’s large, beautiful vegetable garden. But when I married Miriam, my wife, the family tradition of growing a garden seemed to stop. It probably had something to do with the fact that growing vegetables and farming is what I do for a living, so there are always plenty of fresh strawberries, sweet corn, beans and tomatoes available on the farm in season. We didn’t need to have a little garden, when we had a whole farm. So, is our family growing tradition going to carry on? I am very happy to report, that both of my daughters are very interested in gardening. One of them always rents a plot in the city and plants and grows to her heart’s content. The other one is working with peasant farmers in Nepal. Why do I like this? 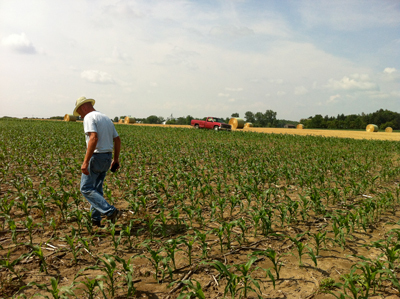 Perhaps it is because growing food is what the Reesors have done since ……. well, since there were Reesors I suppose. I also like it because I believe it is good for everyone to have some knowledge about their food. And what better way to know your food than by growing some? When you grow a garden it helps keep you in touch with and understand weather from a growing point of view and appreciate rain in a dry summer, even if it is on a Saturday afternoon. It helps you to understand that not all tomatoes are perfectly shaped or beans perfectly straight. And, what better reward for all the effort than to taste the fruit and vegetables of your labour and find them delicious? Do you have plans for a garden this spring? If so, I hope you have a productive and fun season. If you don’t have garden plans, why not make a plan? You may have a greener thumb than you think. Celebrate spring by planting trees and learn about the York Region Greening Strategy and forest partners. Enjoy a horse-drawn wagon ride through the forest. Hike with a forester at 11:00 am and 2:00 pm to learn how to identify trees or go for a self-guided hike. Hold slithery “Sciensational” snakes in your hands. Take home a tree seedling to plant. Registration is required and opens one month before each event. Information and registration online in the “Take a Walk in the Forest” section at:www.york.ca/forestevents or call 1-877-464-9675 Ext. 5364. Spring 2013 in Stouffville has been downright cold. This soup can help take out the chill. Heat the oil over low heat in a large pot. Add the onion and garlic and sauté stirring occasionally for 5-7 minutes until the onion has softened. Stir in the cabbage, oregano, parsley and black pepper and cook, stirring frequently for another 5 minutes. Increase the heat to medium and add the stock, tomatoes, kidney beans and carrots. Simmer for 20-25 minutes until vegetables are tender. Add the frozen peas about 3 minutes before serving. If the soup is too thick add additional stock or water. Taste and add salt if needed. Serve with your favourite Reesor’s bread, cheese, and cold cuts. If you have a parmesan cheese rind, add it to the soup and remove before serving. Add frozen Toby’s Cookin’ Greens such as kale or spinach. A look inside the Greenbelt Greenhouse in Gormley, Ontario. When was the last time you heard someone get passionate about lettuce and greens? If you talk to Nicky Church from Greenbelt Greenhouse in Gormley, Ontario (about 10 minutes from Stouffville) you might soon be a convert to their Certified Organic Microgreens. These microgreens are seedlings such as broccoli or kale harvested when 3-5 cm tall and eaten raw or added to cooked dishes. Besides the pleasure of caring for ten varieties of microgreens in the spacious greenhouses Nicky loves packing up the boxes of microgreens because, “I am so happy knowing that so many people are buying this tasty and nutritious food and they are loving to eat greens!” At Reesor’s Market & Bakery you can find their range of microgreens including arugula, broccoli, kale, spring pea, sunflower and more. In July 2012 the Journal of Agricultural and Food Chemistry published the first scientific data on the nutritional content of 25 different microgreens. Generally, they are all significantly (10-40 times) more nutrient dense than either their mature plant or their raw seed counterparts. The microgreens were confirmed to contain higher anti-oxidant concentrations (i.e. vitamins A, C, E and K, and other beneficial phytonutrients) than most foods. Greenbelt Greenhouse is a state-of-the-art glass greenhouse with many computerized ecological features saving energy and water and reducing waste. One feature are ceiling curtains that automatically close in the evenings to prevent warm air from escaping reducing energy use over 35%. A rainwater cistern not only collects excellent soft water for their handwatering system, but it also requires much less energy than to pump from a deep water well. This water is kept clean with air bubbled in from their windmill. 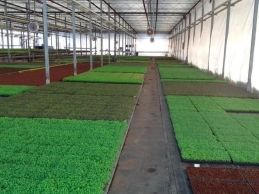 The harvested microgreens are washed in pure water from their deep well, so there is no need to treat it with chlorine, which not only leaves an unpleasant odor it also shortens the shelf-life of tender greens. Adding the greens to a smoothie is one of the best ways to get the full health benefits, but Ian and Nicky also offer their suggestions about how to eat your microgreens such as adding arugula to sandwiches to provide an exciting zing or as a great surprise in fruit salad. Broccoli is mildly peppery with clean broccoli-flavoured overtones and is a great addition in pancake batter or your favourite bread dough. Kale has a mild creamy flavour, yet it is sturdy enough to remain crunchy in a salad dressing. We had lots of fun during our Reesor’s Market & Bakery Grand Opening Week-end. 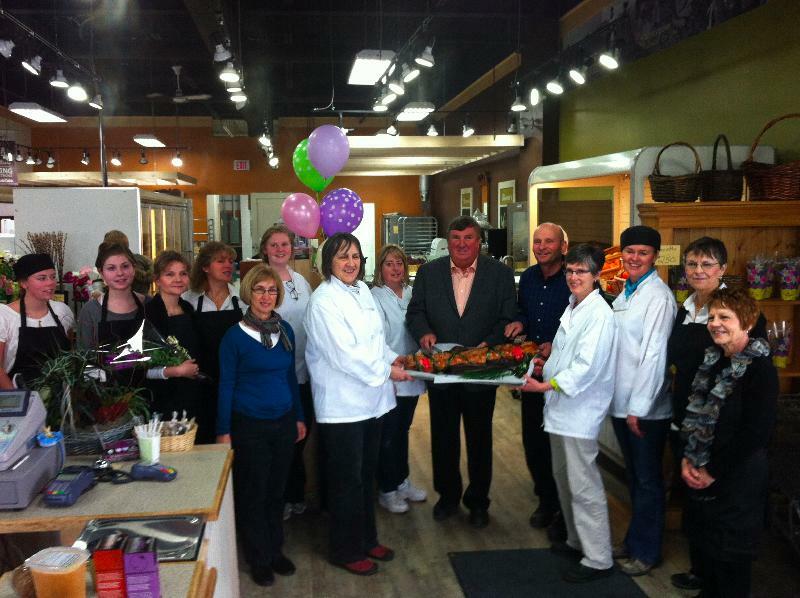 Stouffville Mayor Wayne Emmerson and Jay Reesor did a joint bread-cutting officially inaugurating the store on March 22. It was wonderful to see familiar faces from our former location on Ringwood Dr. and to meet many new people. Thank you to customers, our renovation team, staff, family and friends who made the opening a success.